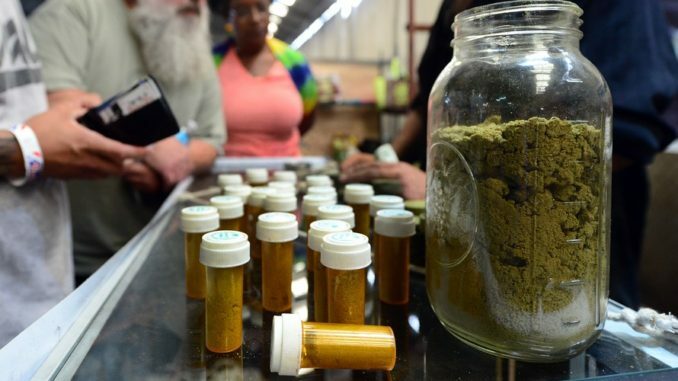 As more and more U.S. states create laws lifting the prohibition of cannabis, medical marijuana users are ditching their prescription drugs in droves. According to data released in a report published by the Journal of Psychoactive Drugs, there has been a mass exodus in the use of prescription drugs in states where marijuana is legal. Themindunleashed.com reports: The research underscores the need for an “evidence-based approach” to the benefits of cannabis, rather than its criminalization and the advocacy of antiquated public health approaches calling for abstinence. Researchers surveyed 450 adults who currently use cannabis at a cannabis law reform event in Michigan, where the plant became legal for medical purposes in 2008. According to the study authored by Daniel Kruger of the University of Michigan Institute for Social Research and co-author Jessica Kruger of University of Buffalo, 44 percent of the medical cannabis users interviewed abandoned their usage of a pharmaceutical drug, cut back on its use, or both, and have instead opted for the sticky green herb and its numerous derivative products such as waxes, vaporizers, and medicated food products. Out of those surveyed, 392 users reported that they use cannabis to help treat their health conditions. These users also indicated that they trust medical cannabis far more than mainstream health care including pharmaceutical drugs, especially due to its effectiveness, lack of adverse effects, cost and availability. Cannabis has been used medicinally by humans for over 5,000 years, and in recent decades has enjoyed increasing acceptance by mainstream society and the medical community alike for its ability to treat an array of health conditions including chronic pain, insomnia, muscle spasms, headaches, menstrual cramps, narcotic addiction, appetite loss, post-traumatic stress disorder (PTSD), anxiety, HIV-AIDS, cancer and other problems, according to the study. In 1996, California became the first state to legalize cannabis for medical use, and over than 30 states have since done the same. Ten states along with Washington, D.C. have freed the herb almost entirely, allowing adults over 21 to partake in the recreational use of cannabis. Cannabis remains illegal under U.S. federal law. Most cannabis products available through dispensaries clearly label the cannabidiol (CBD) and tetrahydrocannabinol (THC) contents of goods sold, giving consumers a clear picture of the two cannabinoids that are most prevalent in medical and recreational cannabis products. Product labels also make clear whether the products are derived from Indica, Sativa or Hybrid cannabis plants, which each have unique physiological effects on users. Civil liberties advocates have greeted legalization as a crucial pillar of criminal justice reform that has helped reduce the disproportionate incarceration of mainly black and brown people who faced hefty sentences for cannabis-related offenses, while legislators and the private industry have been pleased by the economic stimulus provided by the burgeoning marijuana industry. A recent poll by the Pew Research Center also found that 62 percent of U.S. residents, including 74 percent of millennials, favor an end to the prohibition of cannabis.